Property and banking shares took a pounding yesterday in response to the news of higher Additional Buyer's Stamp Duty rates and tougher mortgage rules. Investors took flight on expectations that the tougher new cooling measures will hammer the real estate sector and severely crimp mortgage lending. CapitaLand, the largest developer by market cap, lost 5.9 per cent to close at $2.99, a level last seen in December 2016. Oxley Holdings fell to its January 2017 price, losing 15.85 per cent to 34.5 cents. City Developments also recorded one of the day's steepest drops, shedding 15.61 per cent to $9.46, while UOL retreated 13.55 per cent to $6.70. The sentiment surrounding developers is tipped to weaken further, so analysts expect the sell-off to continue in the near term. Developers tend to face negative reactions after such announcements, with their share prices tending to fall by 3 per cent to 5 per cent, said DBS Group Research. "Depending on the physical market environment, stock prices may weaken further and could fall by up to 15 per cent (in the) month after," the research firm said. RHB Research analyst Vijay Natarajan said the timing of the move was a surprise, adding: "We deem this set of demand-side measures as 'very stringent' and a pre-emptive one, which will have a negative effect on buying sentiment as well as slow down property demand and prices in the near term." Comments by Cushman & Wakefield senior director Christine Li echoed the prevailing sentiment, with her noting that "developers have just loaded up their land banks over the last 18 months in anticipation of blockbuster sales in the second half of the year and beyond". Property agencies were not spared. APAC Realty shed 25.64 per cent to 58 cents, while PropNex, which made its mainboard debut on Monday, plunged 24.64 per cent, or 17 cents, to 52 cents. UOB, the bank with the largest property exposure, led bank losses with a 3.06 per cent fall to $26.26. Depending on the physical market environment, stock prices may weaken further and could fall by up to 15 per cent (in the) month after. 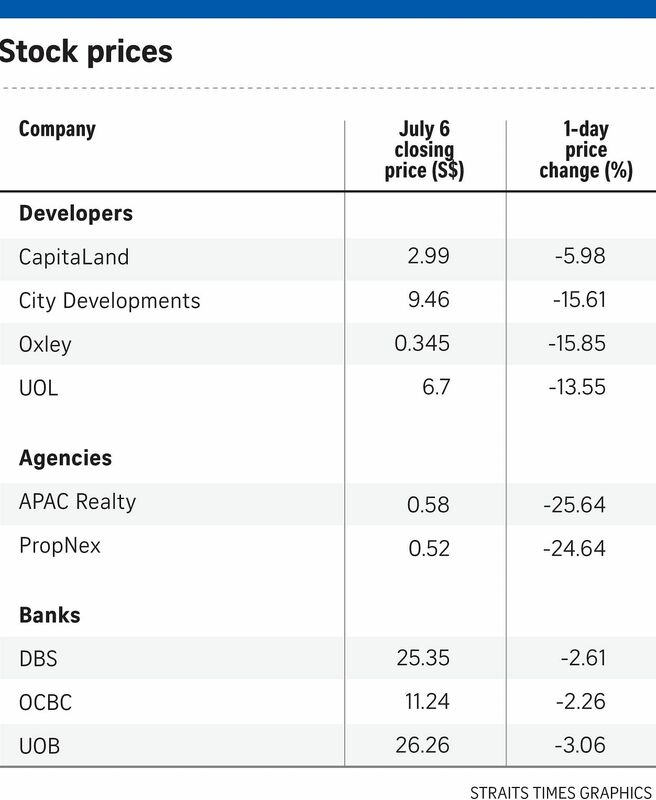 DBS GROUP RESEARCH, on how stock prices of developers would be hit. DBS slid 2.61 per cent to $25.35, while OCBC retreated 2.26 per cent to $11.24. Despite the surprise announcement on cooling measures, JLL head of research and consultancy Tay Huey Ying noted that the moves should end up achieving their intended objectives of cooling demand and moderating price growth, given how nearly all classes of buyers have been affected.